Twice a year Linda, from Calling it Home, hosts a One Room Challenge party. The idea is to redesign/decorate a room in six weeks, while sharing your progress online. You can view her hand-selected group of designers and their makeovers on Wednesdays, and then tune in on Thursdays to see the Linking Participants’ makeovers (of which I will be one!). There are so many fun designs and makeovers happening, you won’t want miss it! I participated one year ago as a Linking Participant and did a mudroom makeover. It made a huge difference in my home – and was probably a room I would have ignored for several more years had Linda not put out a call to action! Here’s the space from the mudroom… behind that pocket door exists a “blah” bathroom! A peek inside… This is a very small powder room. Large window on the wall opposite the door; sink to the right; toilet to the left. As you can see, we’ve attempted to decorate. This is a theme bathroom. NOW BEFORE YOU LEAVE… give me a minute to explain! We live near Washington, D.C. and we love the city. We love the history, the architecture, neighborhoods, you name it. My husband has spent most of his life in the DC area – I’ve been here for twelve years now. We felt like the bathroom was a place where we could design with a bit of a sense of humor (thus Washington’s bust on the toilet) all the while showcasing some DC Area art. (The whole thing started when my mom gave us that tacky DC themed candle… we laughed about it, and then kind of embraced it…). We want this room to be a work-in-progress in terms of the art. My husband and I love searching for new pieces of DC art, and we want to be able to add to the (bathroom) gallery wall. 1. Edit the art and “humor”. It’s kind of mish-mashy right now, and I’d like to streamline it so as to not totally catch people off-guard when they visit our loo. 3. Update the window covering. I plan on ordering the same natural fiber shade that I have in the mudroom (and also my dining room). However, I will order this one with a privacy lining! 4. Accessorize the space. New soap dispenser, hand towels, maybe a rug? via The Vault Files – another ORC room! I think I can handle this. Of course, I thought my mudroom makeover would be a cinch, and it was much more involved than I anticipated, so we’ll see! Wish me luck! And be sure to check out all of the other One Room Challenge Linking Participants at Calling it Home! Yay! You killed it with the mudroom, so I can’t wait to see what you have in mind here. 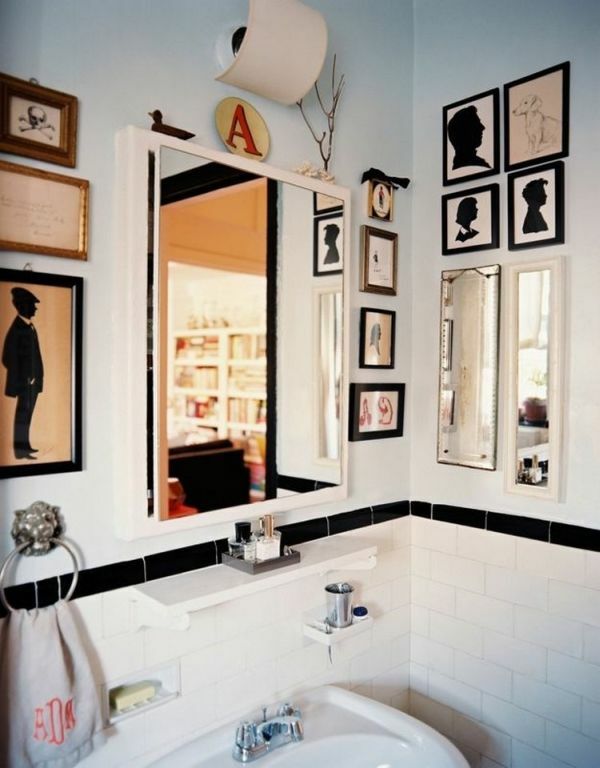 I love dark walls for a small powder room! Good luck! I too will attempt a bathroom makeover for this round of ORC. They’re such tricky spaces, aren’t they?? Excited to share in the misery with you. 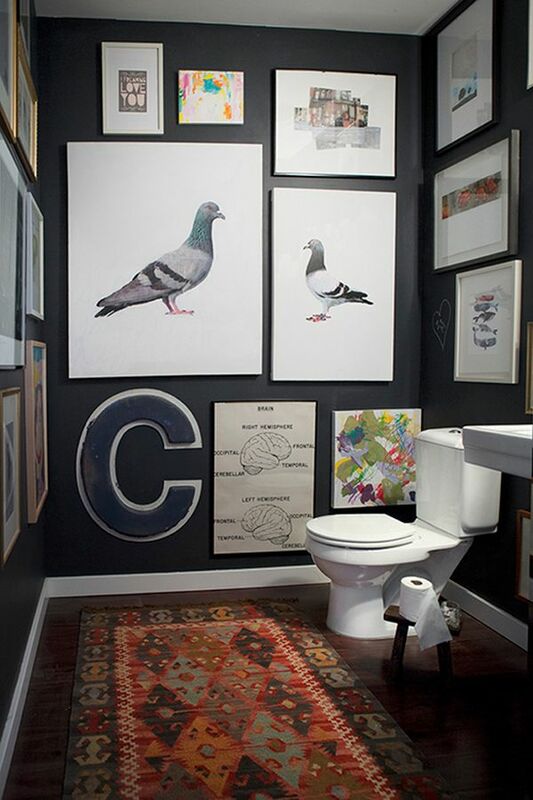 Love the idea of kinda of humorous but still meaningful art in the bathroom! I will be looking forward to see how it all turns out. It was fun to read the background story on all your D.C. themed art; I’m so glad some of it will stay! I was hoping to hear you were planning to wallpaper the bathroom, but darker paint will be elegant as well. 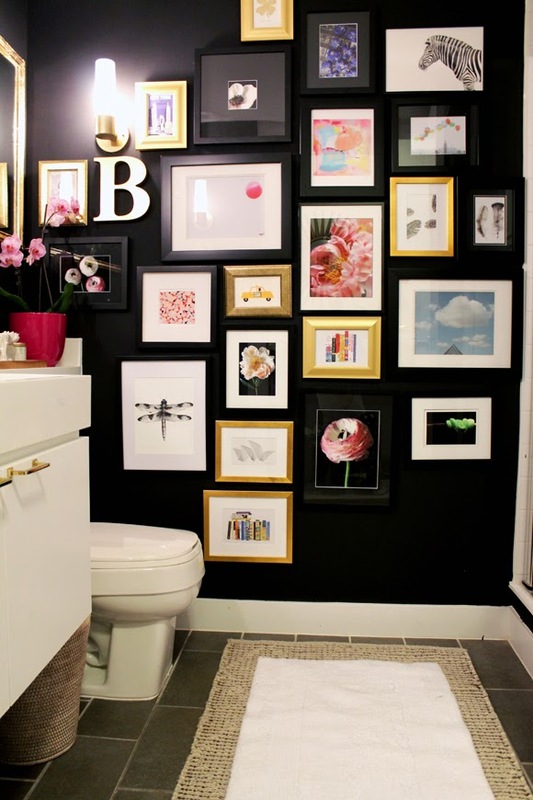 PS love, love art in the powder room!! Yes! Glad to see you back. We’ll both be tackling baths this time round. I know you will make it fab! Thanks, but I cannot take credit for the fantastic job you did on your mud room. This powder room will be a great space. Love your inspiration pics. Good luck. I can’t wait to see the dark walls in your powder room. I really want to paint mine Hale Navy, but I’m scared because it’s such a small space.